Why do you hit fat and thin shots? Why is your ball flight inconsistent? The answer is because your club is passing your hands thru impact. 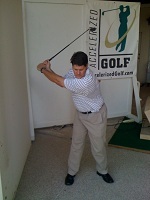 When your club passes your hands before impact this can cause the dreaded fat shot or blade the ball over the green. These shots will not only cause you embarrassment in front of your playing partners but will quickly add shots to your score. 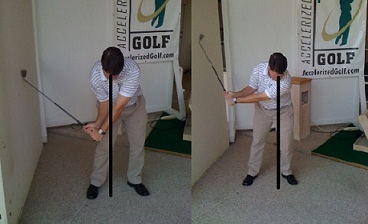 There are several issues that will allow the club to pass your hands thru impact. First, the most common mistake is the ball to far back in your stance. Having the correct forward lean at impact with the ball back in your stance can cause the ball to start right of the intended line. Second, when the clubface is open on your downswing you need for the club to pass your hands to try and square the face at impact. This is a timing issue. Third, you need to sustain the angle between your left arm and the club shaft. This is what the drill below will help you practice. 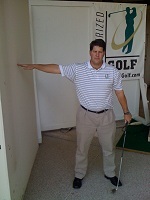 Stand with your feet 12 inches apart and extend your right arm until your finger tips touch the wall. Go to the top of your swing.. Swing down slowly making sure to not hit the wall with the club head. The feel you should have is that you are holding the angle with your wrist. 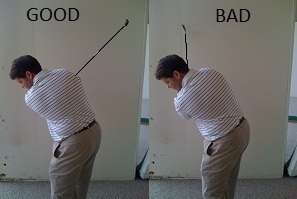 The shaft will become closer to your right shoulder on the down swing. Make sure to keep your nose over your back foot. You do not want to miss the wall by moving in front of the ball. Make sure you keep the club on plane when practicing this drill. The shaft should be at a 45 degree angle to the wall.